The latest stable version of WordPress, 3.1, was first released on 23 February 2011. 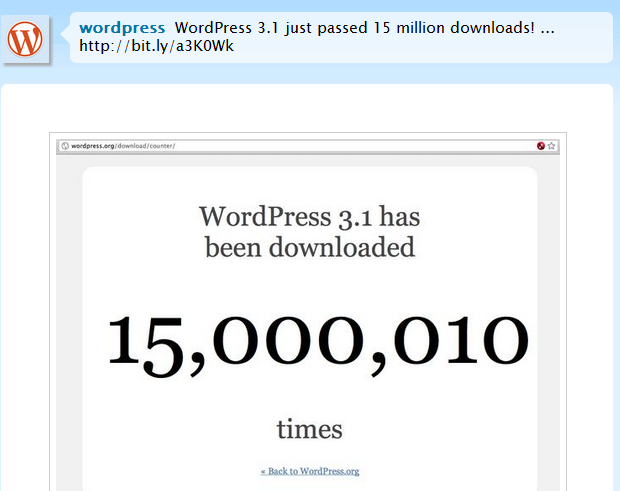 Now, less than 5 months later, the blogging software has been downloaded over 15 million times according to a tweet posted mere minutes ago (and the download counter). Joomla just recently announced that its software has been downloaded 23 million times (note that this is the total number, not for any specific versions of the software solution). For your information: WordPress 3.1 is what TechCrunch uses to power most of its sites. The latest version of the popular blogging software product is actually WordPress 3.1.4, which is a maintenance and security update for all previous versions. Just yesterday, a blog post about the next version, WordPress 3.2, was published, revealing that it will be released ‘very soon’ (release candidate here). WordPress 3.2 will finally drop support for Internet Explorer 6.